Stamp Collecting plus much, much more! Social Philately is a fairly new concept in collecting, although it can probably be said that it has existed within the hobby for many years, but not recognised within the various classes of collecting. 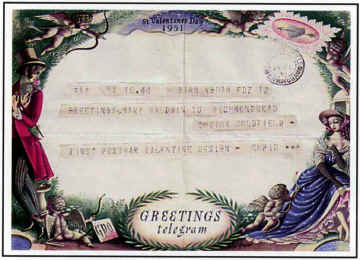 Generally speaking Ephemera, or Collateral Material, within a collection of postal history; aerophilately; and thematics, may be considered as components of the social aspects. These collateral materials — postcards; official documents; shipping and airline routes; commercial services etc., not only add interest to the collection but frequently enhance the story, often forming the basic f ramework on which the philatelic items are constructed. The idea is to link the social/economic history to the historical content of philately. 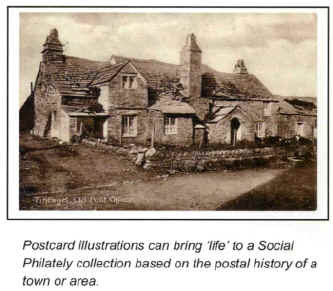 The aim of Social Philately is to present a historical story, or to illustrate the relevance or impact of the postal system within society. You can tell the story of the development of a town or country by using the stamps, covers and documents; likewise the historical background to an important event (eg. The Olympic Games, the American Revolution, the English Civil War, the Siege of Paris, etc.) can be brought to life in a collection of Social Philately. Social conventions, such as sending Valentines, or the development of a business or industry (such as the timber, textile, mining or brewing industries) can also be subjects for a Social Philately collection. Step 1. Choose your subject - if you already collect stamps or postal history you may have items which are ‘sideline’ to your main collection, and which could be incorporated into it. Alternatively, you might have a special interest which would lend itself as a theme - ask other collectors or dealers at fairs to gauge how much material might be available in you chosen area. Try not to pick a topic which has a scarcity of material available, or you may become easily frustrated ! Step 2. 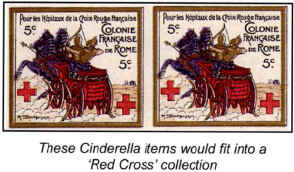 Look for philatelic items and non-philatelic items which relate directly to your topic. Remember - the wider the variety of items, the more enjoyable your collection will be to you, and others! The items listed under “What to Collect” are just some of those possible - Stamp and Postcard magazines, for example, can give you lots of ideas on the range of philatelic material available. Step 3. Arrange the material in a sequence which makes your story flow - this may be chronologically, or by grouping items together. This is your ‘Plan’ and is most important if you intend to display your collection. Step 4. Mount your items on ‘album’ pages, using stamp hinges or corner mounts for envelopes, postcards, etc. Social Philately represents a study of the development of social systems and products derived from the operation of postal systems. It includes material which can be included in other classes of philately as well as non philatelic items which are directly related to the operations and products of a postal system, either as post office equipment or as material developed by commerce to use or reflect post office services and products. A social philately collection forming the history of Philatelic Exhibition could be advanced by the inclusion of tickets, catalogues, souvenirs, etc. 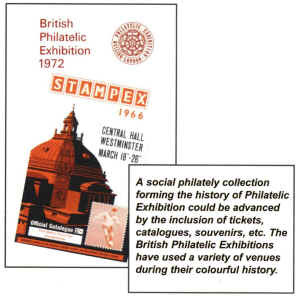 The British Philatelic Exhibitions have used a variety of venues during their colourful history. As you can see from the previous examples, ‘almost anything’ can be included into a Social Philately collection. Of course there are practical considerations of how to display your material, especially if you are entering your collection as a competitive exhibit. But solely from the point of view of collecting, the range and scope of the material is only limited by YOUR IMAGINATION! Remember -You do not need to be an experienced philatelist to be a collector of Social Philately, the emphasis is on history and society - not the postal rates or the different stamp printings! Try to organise your collection so that it tells a story, with a beginning a middle and an end, rather than jus t an accumulation of material of all the same subject. Find out as much as you can about your chosen theme. You’d be surprised how much easier it is to find relevant material that belongs in you collection, once you really study your subject. If it is work or hobby related you probably know quite a lot about your chosen subject already. If it is a completely new concept then there will be the further challenge of not only finding suitable philatelic and ephemera type material for your fledgling collection, but finding information about the subject as well. Research the local Library, or if you have access to a computer the Internet is a useful research tool. Build up as much data about your topic as possible, that way it will become easier to find the relevant philatelic and non-philatelic material to fit your theme. Remember, the function of the non-philatelic material is to amplify, and not merely to add an element of decoration to the collection. Once the basic collection has been formed, some collectors are keen to display or exhibit their work. Local: A good place to start is the local club or Society, most have an annual competition and many are including Social Philately to encourage more participation. National: Social Philately as a UK National level Class made its debut at Glasgow 2000. It was introduced to enable exhibitors who wish to enter exhibits based on a theme related to social history, Up to 50% of non-philatelic material was allowed to be included. Today, this Class has been dropped in favour of the ‘OPEN CLASS’ which has much the same rules and concept. International: Many international exhibitions are now including an experimental or ‘Open Class’ in their shows. Anyone wishing more information on collecting, displaying, or exhibiting Social Philately should contact the Association of British Philatelic Societies. c/o RPSL, 41, Devonshire Place, London W1G 6JY.